We’d love your help. Let us know what’s wrong with this preview of Lanterns of the Old Night by Alcebiades Diniz. Shadow plays. Projections. Unstable, intangible forms. Faded colors on opaque surfaces. Light – the sun, the flame of a candle, the stars – filtered through holes or thin pieces of paper. This is the lantern of fear, a device with ancestral origin that however not remain static. Such apparatus evolved, gained a more appropriate name (magic lantern, an apparatus for delight Shadow plays. Projections. Unstable, intangible forms. Faded colors on opaque surfaces. Light – the sun, the flame of a candle, the stars – filtered through holes or thin pieces of paper. This is the lantern of fear, a device with ancestral origin that however not remain static. Such apparatus evolved, gained a more appropriate name (magic lantern, an apparatus for delightful and wonder) acquired new features and possibilities with lenses and mirrors that allow even fusion of multiple extremely sharp images. The brazier and electric power became the light sources, while the very spectacle of magic lantern projections acquired over time a transcendental, metaphysical meaning. Emmanuel Swedenborg, after the vision he had in a London restaurant, has developed a new theology in which the universe would be a show of projections, the repertoire of images corresponding to the soul of every living being as the light would be the divine influx. The shadow and the light coming from the same source, their conflict only an aspect of the reality. Thus we have Lanterns of the Old Night, an entertainment for the blackest and ancestral nights, suitable for ladies, gentlemen and children, presented ghostly fragments possible and invented memories. The protagonists of this evening performance are presented one at a time: a revolutionary astronomer, a suicidal writer, a missionary photographer, an author ravaged by dementia, a demiurge of cinema. As in dreams, these protagonists are before multiform antagonists and endless, impossible possibilities, so changeable as unpredictable. The existence of each of these imaginary and real and potential persons projected in pale images that have their own power while alive and animated by unsteady blowing of a light source. To ask other readers questions about Lanterns of the Old Night, please sign up. Coming in at a mere 45 pages, you would think that Lanterns of the Old Night would be a quick, breezy read. And you would be completely, 100% wrong. Mind you, tedium is not an issue here. The stories (and I use the term very loosely) are compelling labyrinths that draw the reader/dreamer deeper in with each sentence. It is easy - and comfortable - to become lost in Diniz Miguel's maze(s). The artifact itself is a monument, if you will, to the literature found therein. I mean this in the most lite Coming in at a mere 45 pages, you would think that Lanterns of the Old Night would be a quick, breezy read. And you would be completely, 100% wrong. Mind you, tedium is not an issue here. The stories (and I use the term very loosely) are compelling labyrinths that draw the reader/dreamer deeper in with each sentence. It is easy - and comfortable - to become lost in Diniz Miguel's maze(s). The artifact itself is a monument, if you will, to the literature found therein. I mean this in the most literal of ways: The books physicality is stunning. 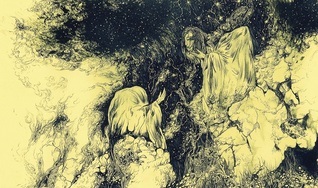 The dust jacket, fully illustrated by Rainbath, is wordless; a piece of occult art that stands by itself. One could easily frame and display this cover on their wall. Under this, the book's cover is relief-stamped with feathering and an old stylized lantern, a fitting symbol for the collection. Canary-yellow end-pages then open to an esoteric-symbolic plate by of a seeker entering a pyramid, candle in hand, followed by a fold-out micro story entitled "Divine Buildings" (replete with a ghastly illustration on the back), which is, in turn, followed by another, larger-than-book-sized piece of Promethean art. Just these elements make this a volume worth owning and displaying (or, perhaps, locking away from prying eyes). The multi-layered vignettes provide their own style of art. There are five pieces herein (not including the easter-egg story, "Divine Buildings"), but each of these five stories contain multiple stories, like a series of literary Russian dolls. Alcebiades Diniz Miguel's many voices are unique, but one can find therein echoes of Roman classical works, touches of the English ghost story, a hint of cosmic horror, and even some dry academic syntax. These various influences ebb and flow, eddying around each other, confusing the floor, walls, and ceiling of the labyrinth, further drawing one in. Perhaps the moon was the most perfect black mirror that had ever existed. he imagined a photographic inversion of the night sky, soft white with gray spots in which an imperfect black circle or semi-circle hung in the midst of the pale landscape, milky and infinite. What might this black mirror of cosmic dimensions reflect? At that moment he realized that he had lost sight of the moon . . . In the second vignette, a weaving path, in and out of reality, inevitably crawls toward death. Albertus Magnus swept up in a demonic vision while meditating on Cicero's mnemonic techniques, discovers that . . . he is not Albertus Magnus. "Some Dead Rats" slingshots between beauty and decay with a quickness that leaves the mind reeling. Enlightenment and dolor are never far away from each other in this nihilistic tale that teases with hope. "The Ago of Ice and Gold and Mud" is a plotless meditation on ritual, oppression, cultural memory, and genocide. It is a contemplative piece, an intellectual riff on the collision between colonialism and the luminous, which results in a somber, gray realization of one's place as a receptacle of collective conscience. This one sticks in the brain for a time after reading it. "The Devil, Almost" lends credence to the title of the book. Here, illusions cast using lantern projections prove a precursor to things, entities, which are anything but illusion. An occult excursion starts in the deception of audiences with visual sleight-of-hand, but ends in dark interstices that are far too real. Here, the light is the deceiver, cast upon the wall, creating ghostly shadows of truth. Now, my vision could embrace, almost effortlessly, a considerable fraction of the universe, a stellar whirlwind that propelled the ancient material, withered and bright, along a course of black and icy viscosity. The inhalation of an abyss coordinated the swirling regions, holding galaxies in infernal gars whose function was to devour and exfoliate. The vastness of celestial gravity worked as the wheel of a mill and soon what had been an endless ensemble of celestial matter was reduced to dust decanted to its atomic level, uniform and frail ash, or the residue of crushed bones. This mill, however, is only the first cogwheel. The remaining atoms are recombined in a moving patter of cyclic formations which transcends mere repetition; no two formations are identical, neither are they entirely dissimilar. Planets, stars, galaxies, are each equipped with elements of various composition with which to establish their celestial dance that, once set in motion, might unfold over an immeasurable time in which millennia pass by like seconds. But even this space of time is not truly infinite. One day, the whole universe will again be old, decrepit, moribund. It will again go through the same destruction and disintegration process, resurfacing in an eternal cycle, replete with variations in tempo, tone, detail. There is no death, not even the hope of permanence or stasis. Because the universe needs eternally to repeat itself and the beauty of its unfoldment, a dead cosmos will never exist. Neither will the reader's mind ever fully escape this welcome literary labyrinth. 'The eyes, I reflected, appreciate the beauty of a gory spectacle." As usual with most books I read I tend to write out a page+ of a review before not being able to be assed to finish it. In the case of Diniz' Lanterns I'm just not quite sure I can comment on some things without another reading. Excuse the quick rambling that follows. I have some previous experience in reading a short story by Diniz, The Extinction Hymnbook was in Kos'mos Cometh, and that story is also the last of this very short 'The eyes, I reflected, appreciate the beauty of a gory spectacle." I have some previous experience in reading a short story by Diniz, The Extinction Hymnbook was in Kos'mos Cometh, and that story is also the last of this very short collection. While it wasn't my favorite of Kos'mos he certainly caught my eye since I had never heard of him before that point. While there is some (very black) humor in a few of the stories, the collection overall is has a dark, melancholic, foreboding, almost "apocalyptic" feel to it, though that's not quite the word I'm looking for. Diniz' prose is overall pretty good, I do feel some lines were overly long, and there were a few that took repeated reading to grasp. Good overall with some nice imagery. He also seems to have a fairly unique narrative voice, style, approach or what-have-you for an author of the modern Weird tale. That may be colored by knowing where he's from, but having read the whole collection that feeling, which I had after reading Kos'mos, has been greatly reinforced. A couple favorites were the third vignette from Some Dead Rats and the absolutely brilliant but bleak The Age of Ice and Gold and Mud. Quick aside, the artwork is great. Not a surprise though given how nice the artwork, by other artists, has been for the Mount Abraxas line.